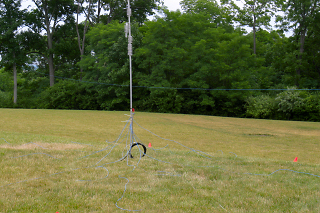 Our Field Day site was located in Fairborn, Ohio (a few miles northeast of Dayton) near the campus of Wright State University. 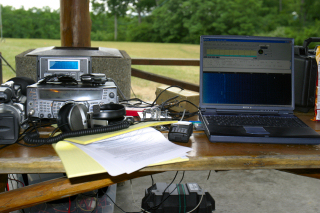 We operated with a designation of "3A" (three alpha) indicating that we had three HF radios on the air simultaneously. More than three HF radios were present, however. I can remember two Kenwood TS-2000's, a Yaesu FT-897D, an Icom IC-706MkIIG, and an Alinco DX-70. 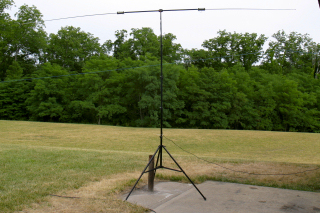 Contacts were made on 160-m, 80-m, 40-m, 20-m, and I believe a few contacts were also made on 15-m and 6-m. The rain started in the early evening and continued until sometime in the early morning hours as the following brief video (0:17 minutes) shows. The WCOARA, by the way, is the West Central Ohio Amateur Radio Association. This club owns the 145.11 high-profile repeater systems in Dayton, Ohio, and Columbus. Participants and attendees included Rob, KB8UEY, Randy, KA0AZS, Dave, KB8UQP, Chris, KC8WRA, Dave, W8QF, Glen, KC8LA, Jonnie, KD8BUP, Lynn, N8LXK, Shirley, N8LX, Melinda, KD8BIK, Pat, N8WAA, Don, KB8LWL, Delmar, KC8ADU, Jeannette, KD8AFR, Jim, N8UCL, Wynn, W6CDR, and myself, N8OIF. Much of the terrific food was prepared by Dave, W8QF, and Melinda, KD8BIK. If I have forgotten anyone, please let me know. My email hyperlink is near the bottom of the page. First, the photos from this year's event are available on my Google+ site, as well as photos from other Field Days, including a couple in Columbus, Ohio. Dave, KB8UQP, is demonstrating one way of getting an antenna strung from a tree. Video: 2:41 minutes. Glen, KC8LA, making contacts on the 160-meter band. The radio that was used was the Yaesu FT-897D. The antenna was a long wire antenna 283 feet in length (the thin blue wire located behind the vertical antenna in the photograph). The wire was not cut specifically for any particular ham band; the length was appropriate considering the trees that were available. An antenna tuner was also in use. The station contacted was KG8BT located in Willard, Ohio (about 25 miles south of Sandusky). Notice the almost continuous static crashes on the receive audio from thunderstorms. Video: 6:10 minutes. 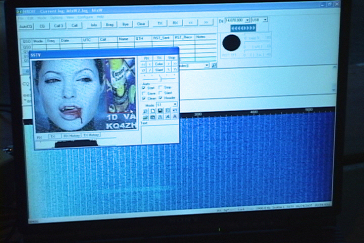 In this frame grab from a video you can see a fairly clean SSTV capture off of 20-meters using MixW. What you may not see is a repeating pattern of noise. What you do see in MixW's waterfall display is lines spaced every 75 Hz or so. I believe that it is noise or IMD in the laptop's built-in sound card. I have a external sound card for the laptop that I should've brought out to Field Day. With the present set-up though, I had trouble decoding PSK31 and other sound card modes all weekend. Of course, I am still new to MixW and probably don't have audio levels set correctly. Here is a video of Don, KB8LWL, making a contact on Sunday morning with the Icom IC-706MkIIG and the vertical antenna. The contact was with WC4EM on 21.338 MHz on the 15-meter band at 1622Z. The exchange received was "1F" from the West Central Florida Section. The "F" indicates that this Field Day was being conducted from an emergency operations center. WC4EM is the Sarasota County Emergency Management Agency. Video: 2:04 minutes. Here I (N8OIF) am, making a contact on 40-meters. The station that I contacted was W0ICT, The South Heartland Amateur Radio Contest Club, located in Wichita, Kansas. You will notice I was using my computer for logging (WriteLog version 10). However, we were also recording our contacts on paper, and ultimately paper worked out better this year, considering the relatively low number of contacts that we made. Each tablet was labeled with the amateur radio band. This ensured that at any one time we did not have more than one radio on a band. My HF rig is a Kenwood TS-2000X. The wattmeter is a Powermaster made by Array Solutions. I think it worked out well. The antenna was a Buddipole. Video: 1:45 minutes. Finally, here is some extra video that was shot.